SINTESI CONTENENTE UNA BREVE DESCRIZIONE DEL LAVORO SVOLTO E DEI RISULTATI OTTENUTI: BACKGROUND: Malignant Pleural Mesothelioma (MPM) is a tumor with a dismal prognosis arising from the mesothelial cells lining the pleural cavities. At cytology, the differential diagnosis between MPM and benign reactive mesothelial proliferation (RMP) may be challenging. To date, there are not reliable markers useful in distinguishing these entities in cytological specimens. MicroRNAs (miRNAs) dysregulation and profiling demonstrated to be effective for MPM diagnosis in cell lines and histological samples. AIM OF THE STUDY: This study evaluated the performances of a miRNA profiling-based test in distinguishing MPM from RMP in cytological specimens. METHODS: A large panel of miRNAs was evaluated in an immortalized mesothelial cell line (MET-5A) and in two malignant mesothelioma cell lines (H28 and H2052) by qRT-PCR. The differentially expressed miRNAs were then assessed in 51 MPM and in 40 non-neoplastic mesothelial histological specimens. A threshold was calculated for each miRNA and then the system was applied on 29 MPM and 24 RMC cytological specimens. RESULTS: Among the initial panel of 15 miRNAs, six were differentially expressed in cell lines and were retained for the further analyses. 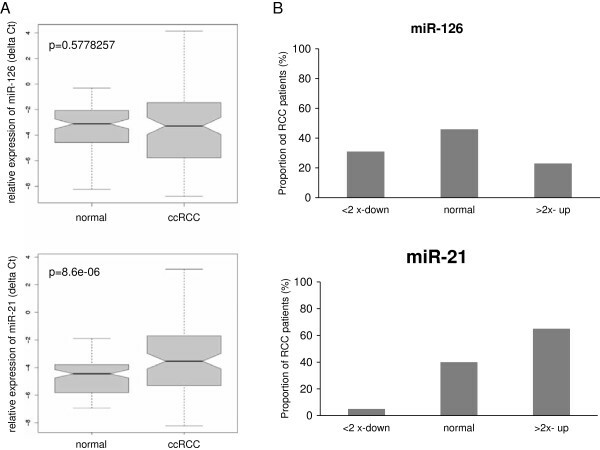 MiR-19a, miR-19b, miR-20a, miR-21, and miR-25 were over-expressed, whereas miR-126 was down-regulated in MPM compared with non-neoplastic mesothelial specimens. MiRNA profiling of the cytological samples correctly identified 25 MPM and 21 RMC, with a sensitivity of 0.86 (95% CI, from 0.69 to 0.95) and specificity of 0.87 (95% CI, from 0.68 to 0.96). CONCLUSIONS: Subject to the validation in further larger studies, miRNA profiling is an effective and reliable method for the diagnosis of MPM in cytological samples.